The FE Mesh Page constructs finite element Meshes from Skeletons, and manages and modifies the Meshes and the SubProblems that they contain. The layout of the page is shown in Figure 3.19. At the top of the page is the Mesh Chooser, which determines which Mesh is being operated upon. Below that are a set of buttons. Below the buttons are a Mesh Information pane, a Subproblems pane, and a Mesh Operations pane, for modifying the current Mesh. The Mesh Chooser has three components, because to specify a Mesh it's necessary to specify the Skeleton containing the Mesh and the Microstructure containing the Skeleton. The New button creates a new Mesh in the Microstructure and Skeleton specified by the first two parts of the Mesh Chooser. The button brings up a dialog box in which to choose the types of the finite elements used in the Mesh. The Rename button assigns a new name to the current Mesh. The Copy button makes a copy of the current Mesh. The copy becomes the new current Mesh. The Delete button deletes the current Mesh. It has no other effect on the current Mesh's Microstructure and Skeleton. The Save button saves the current Mesh in a file. It has the same effect as the Save/Mesh command in the File menu, except that it only saves the Mesh chosen in the Mesh Chooser. The Info pane displays information about the current Mesh, including its current status, its size (in terms of numbers of Elements, Nodes, etc. ), its current time, and the type and size of its data cache. In this situation, many Mesh operations will be unavailable until the Mesh is rebuilt, using RebuildMesh in the Mesh Operations pane. The Subproblems pane manages SubProblems, which are portions of a Mesh. A Mesh can contain many SubProblems, which need not be distinct. Fields and Equations are defined and solved on SubProblems. Using SubProblems allows different solution techniques to be used on different Equations, or allows the Fields in one region to provide boundary conditions for another. For example, the Temperature Field could be solved for on a PixelGroup SubProblem which was defined to include all Elements whose dominant pixel type includes a specified PixelGroup, while another Field is solved for on a SubProblem defined to include only Elements with a given Material. 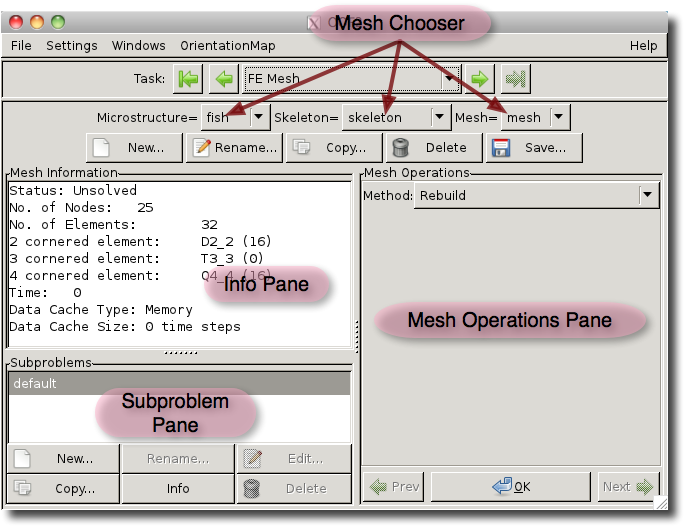 The top part of the Subproblems pane is a list of all of the SubProblems defined in the current Mesh. The list always contains a SubProblem named default. The default SubProblem is an EntireMeshSubProblem, which contains all of the Elements in the Mesh. Clicking on the name of a SubProblem in the list allows the buttons below the list to operate on the selected SubProblem. The New button brings up a dialog box for creating a new SubProblem. The different kinds of SubProblems are enumerated in SubProblemType. Each new SubProblem must have a unique name. Non-unique names will have <x> appended to them, where x is an integer chosen to make the name unique. The Rename button allows you to rename an existing SubProblem. It is not possible to rename the default SubProblem. The Edit button allows you to change the definition of a SubProblem, either changing the parameters by which it's defined, or changing its type. It is not possible to edit the default subproblem. The Copy button copies the currently selected SubProblem. It brings up a dialog box to specify a name for the copied SubProblem and the Mesh to which it will be copied (which may be the same as the Mesh containing the original subproblem). The Info button prints information in the Messages Window about the selected SubProblem. The Delete button deletes the selected SubProblem. It is not possible to delete the default subproblem. The pull-down menu labelled Method selects a MeshModification method. The area immediately below the pull-down menu is for setting the method's parameters, if any. The OK button applies the selected modifier to the current Mesh by invoking the OOF.Mesh.Modify command. The Prev and Next buttons cycle through the recent Mesh modification methods. They only reset the pull-down menu and parameters. They don't have any direct effect on the Mesh.